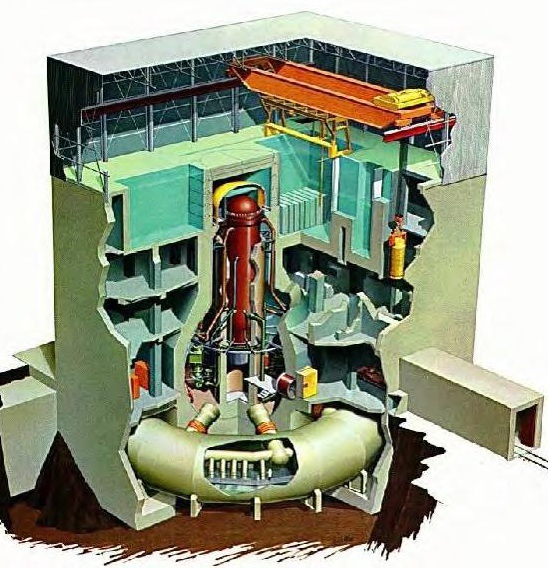 Picture of a Boiling Water Reactor Nuclear Power Plant like the Fukushima Plants. My dad refers to this image in his interview. Cross-posted on my geology blog Georneys. That link to a simple and accurate explanation is very good. I see nothing incorrect in it. I agree with the author’s statement that the main stream media coverage has been terrible with multiple gross errors in each report. actually there are quite a few errors e.g. the half life of I131 is 8 days and Caesium 30 days so these isotopes are not “all gone” but still mostly undecayed. Some people(65?) have actually received radiation doses above the acceptable limit. Still a useful article but you need to bear in mind the blatant pro nuclear bias. One of the Japanese commenters refers to the containers in the No1 plant not being zirconium – if so what? Also refers to MO2 fuel in the other plants – later comments indicate this contains plutonium – what are the implications when the containers overheat and melt? Additionally, while I found the article to be informative. It should be pointed out that the author’s area of expertise is not in Nuclear Engineering or Physics. That always rings a skeptical bell in my head. Also, the union of concerned scientists has a number of useful articles on the subject. There’s been a third explosion. and the Japanese are calling on the Unites States for help. I am tired of hearing some people say everything is ok.
I’m going to contact the Dennis Miller radio show in the morning and request that they contact your dad for an interview on his show. It’s on from 7:00 to 10:00 am (California time) Mon to Fri. I’m really hoping he’ll say yes. These will not ‘split up into smaller atoms’ – that description applies to fission reactions, which is what happens to the uranium. The Cs and I (and other) fission products undergo ‘beta decay’ reactions, which essentially turns a neutron within the nucleus into a proton, changing what element it is (one more proton) but not changing its atomic number (# protons + # neutrons). @Jack99: Ah no. The major cesium isotope in fresh fission products is Cesium 138. That is ~6% of fission yield. That has a half life of ~30 minutes. It is also formed as a decay product of Xe 138 with a half life of 17 minutes. Cs 138 is ~ 17,000 times more radioactive than Cs 137. Usual practice is to let spent fuel sit for a few months (or longer) before doing anything with it. That lets the intensely radioactive things like Cs 138 decay to nothing. The Cs 138 is pretty much all decayed now. Also there is still the I131, for which the goverment is handing out potassium iodide supplements. The point is moot, as people have indeed reportedly been exposed to significant radiation (source: Japanese government) and the US fleet have withdrawn from the area after detecting radiation 100 km offshore. In my view, the attempt to minimise the danger of radiation leakage in this linked post was equally reprehensible to the overeaction of the media. Events are proving the author wrong and damaging his credibility. Hi, I created a sign on just to say thank you to you and your father. I was feeling scared tonight and the cool and rational discussion helped a lot. From a press conference this morning, that I think everyone in the media somehow missed….well I guess it did occur around 3 AM EST so it can’t be real news to us. So. Everything’s not perfect, but under control for now. The average Japanese citizen affected by the quake and tsunami are not worried about radiation. According to my friends in Japan, the issue is food because a lot of the supermarkets in that area donated food, but now they are running out (or have run out) and so the issue people are worried about is food and clean water. @Jack99: I realize that you were talking about Cs137. Cs137 is not what the reports were about. It is not the cesium that was being talked about on the link. Cs137 is not the only cesium isotope produced during fission. It is not the major source of radioactivity from cesium isotopes in fresh fission products. It is the major source of radioactivity from fission products after a few months. I am not trying to minimize any hazards. I don’t think the linked to post was trying to minimize any hazards either. There are a great many main stream media outlets that are trying to maximize the hazards. Distortion in either direction is not acceptable. There appear to be some new development that are not clear. It is hard to figure out what is actally going on when MSM is inserting so much distortion. The problem with distortion and maximizing the potential hazards is that it puts people under more and unnecessary stress and people under stress become desperate and desperate people do desperate things. I think that is already happening. One of the pumps stopped because it ran out of fuel. A trivial mistake, but the kinds of mistakes that people make when they are under tremendous stress. The people in Japan managing this thing must be under tremendous stress. So far, I think they have done a very good job under very difficult circumstances. Probably most of those workers have lost family members or lost contact with family members due to the earthquake and tsunami. It must be extremely difficult for them to focus and do the correct things to manage their extremely difficult situation. @daedalus2u: That’s an important point to consider in a disaster plan. In any widespread disaster, the people who are expected to implement the plan may also have to be coping with great personal loss. I think what the utility should do is bring operators from other nuclear plants in Japan and give these operators a break. They can’t replace all of them because local knowledge of the local plant is highly necessary, but more bodies would reduce the stress load on those who are there now. I presume they could get hundreds of volunteers from the other sites. That would make a big difference. A few minor errors in the 2nd follow-up interview. The first time Cmdr Mervine mentions the reaction between the fuel rod cladding and water (steam) that occurs if it gets too hot, he says it forms zirconium dioxide and H2O. I’m sure he meant H2 (hydrogen gas), not H2O (water). The second time he mentions this, he does say H2, but also leaves off the “dioxide” from the zirconium. If someone is listening way too carefully (which we should encourage), they might get confused. Honestly I was not accusing you of minimising the dangers. I am interested in this because Barry Brooks is located the University of Adelaide just across the road, and is a prominent nuclear advocate. As a BHP shareholder and a South Australian it is in my personal best interests to see increased use of nuclear power (we have the Olympic Dam uranium mine). Nevertheless the safety issues must be addressed honestly, and Barry has lost credibility in my eyes. 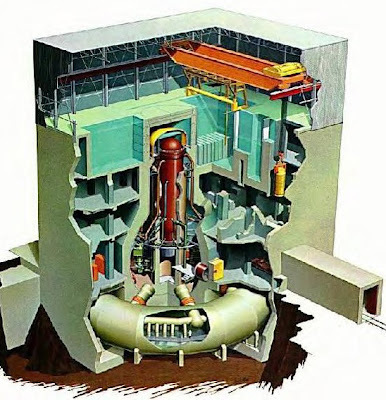 Now about that Cs137 – I presume the fuel rods had been in the reactor for quite a while – a few months at least? Enough for a small amount of Cs137 to accumulate. Something must account for the radioactivity seen e.g. by the US fleet. With you, my heart also goes out to the heroic Japanese workers, who deserve medals for doing their duty under such circumstances.